Upcoming Nintendo Switch exclusive, Super Smash Bros. Ultimate, will reportedly support up to 32 players online. News of the player count comes way of Japanese retailer GEO, which has started to distribute a pamphlet for the platform fighter. And on said pamphlet, there's a page that states up to 32 players will be supported online. Now, unfortunately, the pamphlet doesn't divulge any further specifics around its claim of 32 players, meaning, it's not clear if this is for some type of unannounced mode, online tourneys, or if regular matches can support a whopping 32 players. However, the latter seems unlikely, and the former two options are probably what this is referring to. It's also possible there is some misinformation or a mistake on the pamphlet's behalf. In other words, until Nintendo officially announces or reveals anything about the topic, it's best to take the information here with a grain of salt. After all, the only thing you can take to the bank these days is official confirmation. In the meanwhile, while we wait for official word from Nintendo, Smash fans are having a little fun with their speculation over what this could mean. 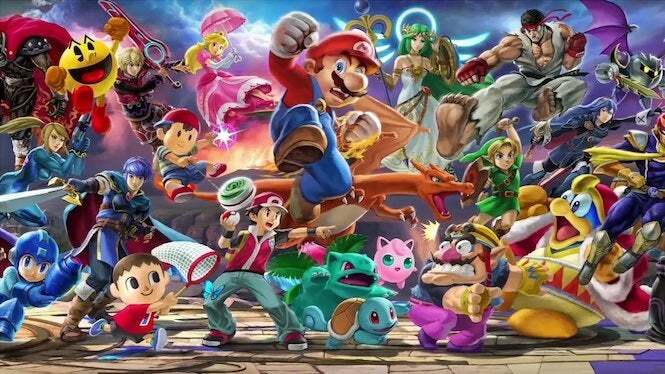 Finally, Smash Battle Royale is here. What if it’s a 32 Player version of Smash Run? THAT WOULD BE AWESOME!! Just like how Smash 4 was with their online tourney mode!! I hope it's a lobby system. That'd be amazing. Super Smash Bros. Ultimate is poised to release later this year on December 7th, exclusively via the Nintendo Switch. For more news, information, and media on the highly-anticipated platform fighter, be sure to peep all of our previous coverage of the game by clicking right here. And of course, feel free to hit the comments and let us know what you think this 32 online player count is referring to.